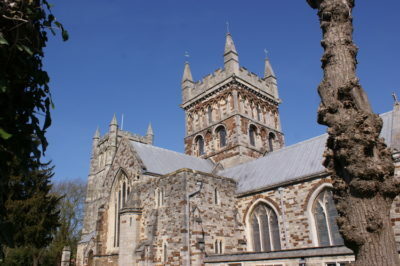 Some of their voices have spoken for Wimborne Minster for more than 350 years, others for barely 50, but there is no doubt that the Minster’s collection of organ pipes is among the finest, most historically important of its size in the country. The earliest date from 1664 and were made by Robert Hayward of Bath as part of a commission to re-instate Wimborne’s parish church organ following the Restoration – an earlier instrument had probably fallen into disrepair, some time before the iconoclastic ordinance passed by Parliament in 1644 commanded the removal of all church organs. Other pipework made by organ builder Brice Seede is from 1764 and still more comes from the 1840s and the 1890s. The organ itself – the console, soundboards, stops, pedals and casework – is mostly from 1965, the date of the instrument’s last major overhaul. The LCD display on the console is the most obvious sign of work carried out in 1986, when the organ’s range of pre-set combinations was expanded. Its blend of electro-mechanics is all but unique. 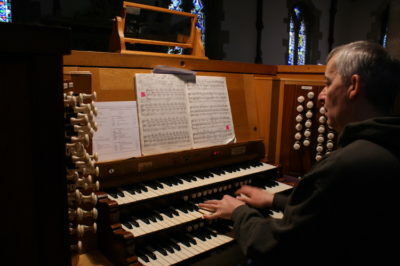 The keyboard action is electric, but some of its 3000 or so pipes and other mechanisms are operated by a system of treadles and wires that run beneath the floor from the console in the north choir aisle, where it has been since 1965, to the pipes housed behind the south stalls. The electrics exhibit the kind of idiosyncrasy that might be expected in an instrument of its vintage, some of the pipe metal is a little thin in places and the soldering is not all up to modern standards, but the Minster organist for the last 30 years, Sean Tucker, knows how to get the best from it. Just about. It turns out that such attribution of human characteristics is commonplace in ‘organ-ic’ circles where pipes have ‘voices’ made by careful adjustment of their ‘mouths’, ‘ears’ and ‘tongues’. The Minster organ’s repertoire of character quirks is just as anthropomorphic – it can be as cantankerous as the best of us and is subject to all manner of aches and pains. By day Sean teaches piano and composition at Poole Grammar School and Talbot Heath School, then plays for three choral services most Sundays as well as Friday night rehearsals. It is a 70-hour week, but the organ is invariably the ideal salve for any stress. ‘I can have had a really exacting day and arrive for practice absolutely exhausted, but within ten or fifteen minutes I can be lost in the music, just consumed by playing the organ. The organ is maintained partly by a bequest made by former Minster choirboy Edmund Barnes who once had to rely on a whip-round from his fellow choristers to buy shoes. 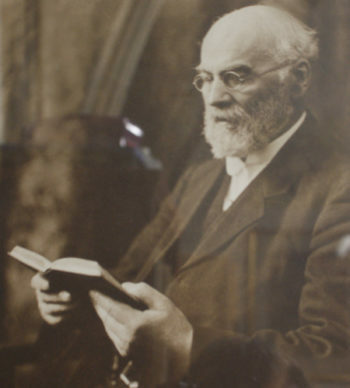 He moved to London, trained as a teacher and became the first mayor of St Pancras in 1900, but he never forgot where he came from and on his death in 1926 created the fund that continues to provide for the Minster’s choir and organ.